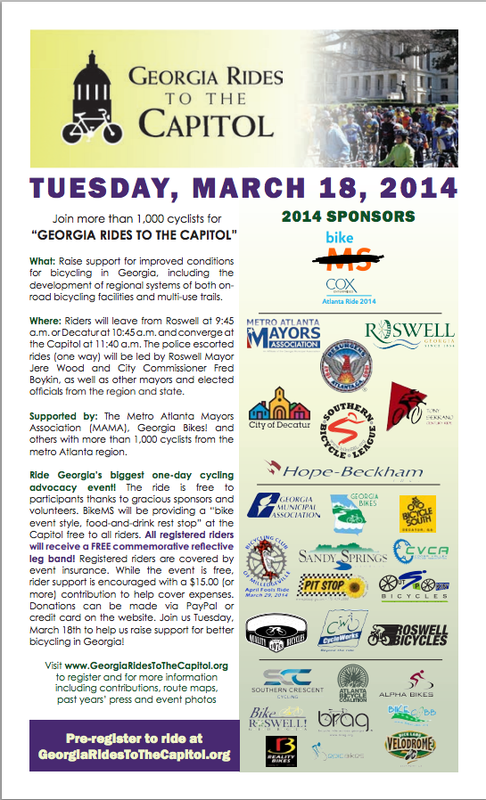 The ninth annual Georgia Rides To The Capitol bike ride is coming up Tuesday, March 18th. I know a lot of y’all have done this ride and we hope y’all can join us once again. The ride supports cycling advocacy efforts in Georgia and we routinely have over 30-40 metro area mayors and other elected officials join us on the ride. The ride is split into two parts – the Decatur option leaves from the E. Lake MARTA station parking lot (north side of DeKalb Ave.) and is a slow paced, 5 mile ride to the state capitol. We always have plenty of beginners, families and folks just riding for fun! The ride is police escorted to the capitol, but cyclists are on their own for the return trip. Last year we had Lt. Governor Casey Cagle address the riders along with other statewide officials. It’s a great way to show support for cycling and an opportunity to meet (and ride with) a lot of elected officials! Please feel free to spread the word! Apologies for any cross postings.